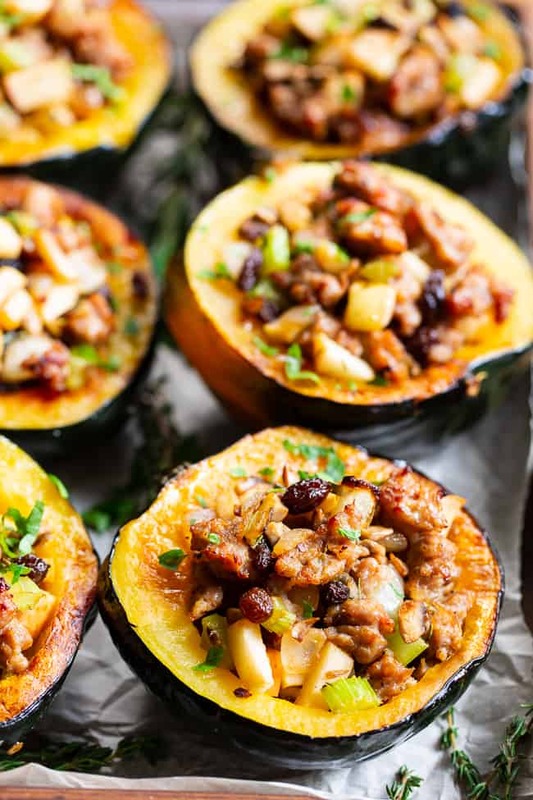 This roasted acorn squash is stuffed to the max with absolutely everything you’re craving! 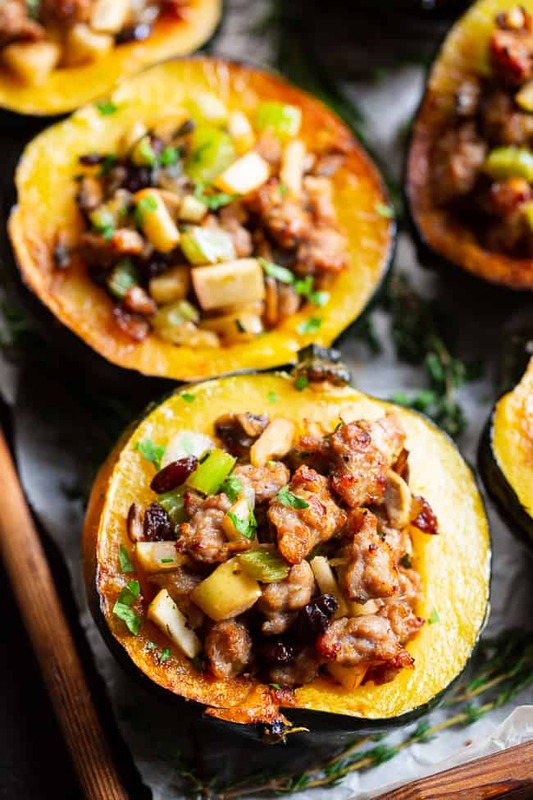 Savory sausage, veggies, and herbs with sweet apples and raisins make this the ultimate stuffed roasted acorn squash this season! 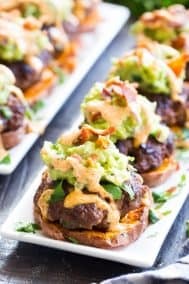 Paleo, dairy-free, and Whole30 compliant. Every year I HAVE to make a new recipe for stuffed roasted acorn squash – it’s just completely necessary. True, they each have a lot in common, BUT I like to play around with different flavor and texture combinations depending what I’m into at the moment. I do admit though, there is just no way you can go wrong with stuffed acorn squash. 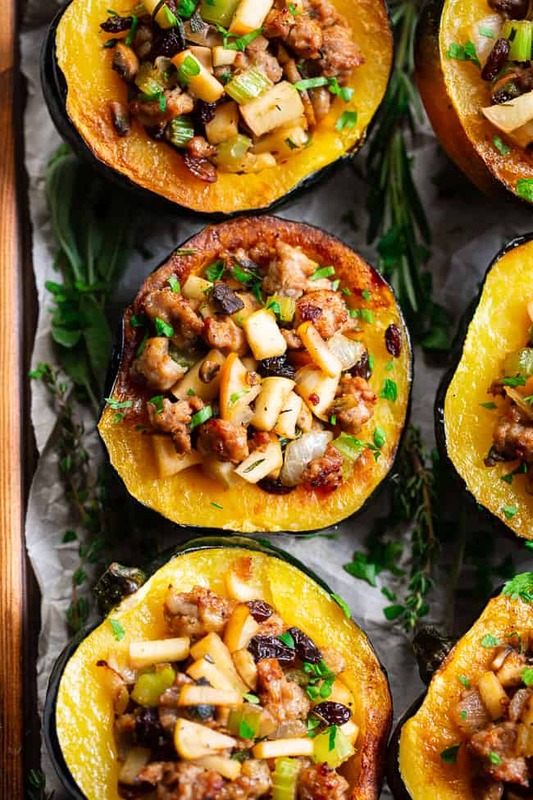 Every stuffed roasted acorn squash is paleo gold in my opinion – or better. It’s comforting, nourishing, and addicting all at the same time! 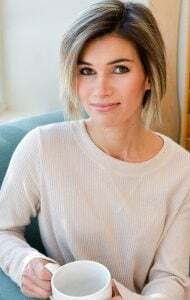 Not to mention gorgeous, too. A crowd pleaser on Thanksgiving or whenever you’re having guests over. Easy to throw together but LOOKS so impressive. 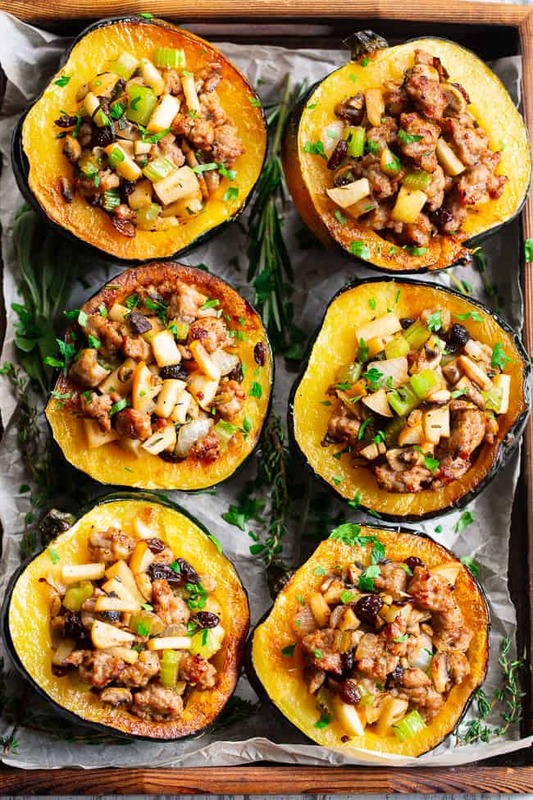 For the stuffing, I went the sweet savory route as I typically do with acorn squash. 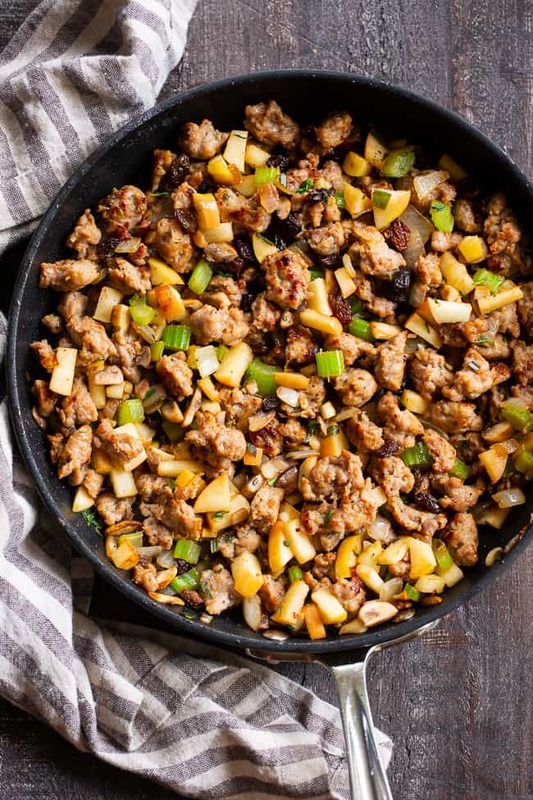 Sausage (use sugar-free to make it Whole30 compliant), lots of veggies, herbs and spices for flavoring, apples and dried fruit. I actually went with both raisins and dried cranberries for my version since I couldn’t decide between them! If you’re doing the Whole30 and looking for fruit-sweetened cranberries (no added sugar) these are my absolutely favorite. Before we get ahead of ourselves with that ridiculously tasty stuffing, let’s talk about roasting the squash. Getting the right flavor and consistency is important to me for sure (it’s your edible bowl after all!) so I like my squash to be roasted to perfection. After cutting the squash in half and scooping out all the seeds, I brushed mine with melted ghee (coconut oil is fine too) and sprinkled with sea salt. I always roast my veggies on parchment paper since I think it helps avoid sticking and burning. That said, if you have a great non-stick baking sheet, it’s not necessary. Place the squash halves face down on the baking sheet to roast. I always check mine for doneness a few times but pushing on the skin side – it should be soft but not TOO soft. 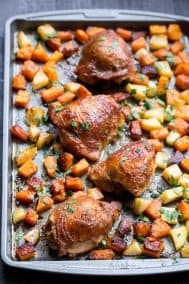 This can take between 20-30 minutes in the oven depending on the side of your squash. You can always flip it over to get a better idea of how close it is to being done. 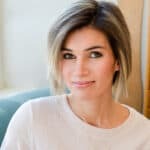 I love mine to be nice and caramelized, and soft but not mushy. While the squash roasts, you make the stuffing on the stovetop! Doubling up on cook-time is always a good thing. Once both stuffing and squash are done, you fill the squash (or overfill, as I do!) and then make the magic happen with the broiler! I broil mine on high until nice and toasty on top – how “done” you want it is up to you. Once done, you can garnish with more fresh herbs or just serve as is. 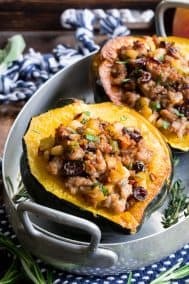 This stuffed roasted acorn squash is obviously wonderful to serve right away, BUT you can also save the leftovers – already stuffed – to reheat later on. 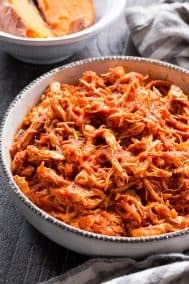 If you want to make everything ahead of time, you can prep everything, cover and refrigerate and reheat the squash in the oven, fill, and broil right before serving. I hope you’re ready for a head-spinning-ly delicious savory/sweet stuffed roasted acorn squash. Let’s preheat our ovens, grab our sharpest knife (to slice that squash!) and let the magic begin! First, roast the squash. 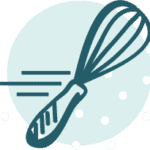 Preheat your oven to 425 degrees F and line a large baking sheet with parchment paper. Cut each squash open, lengthwise, the scoop out the seeds/strings with a spoon, leaving a “bowl” in the center. 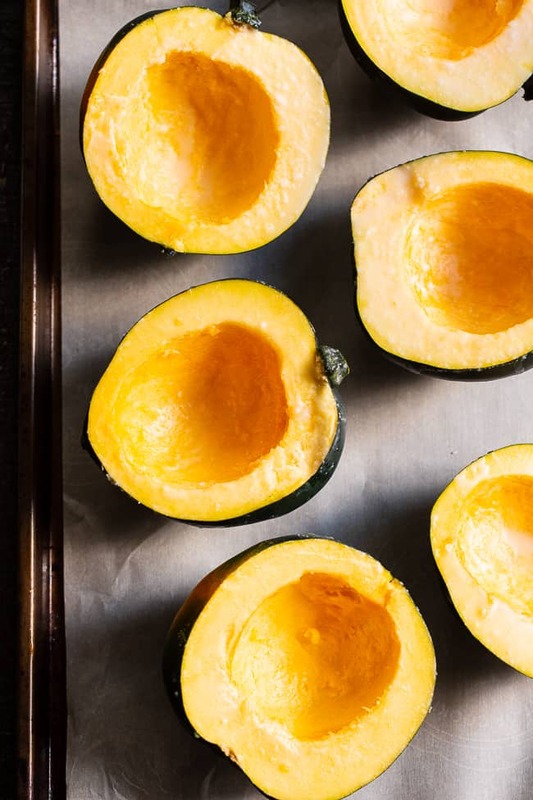 Brush the top of each squash half with melted coconut oil (or ghee) and sprinkle lightly with sea salt, then place face down on prepared baking sheet, and roast for 25-30 minutes, or until top of the squash feels soft when you press on it. Roasting time will vary depending on the size of your squash. You can remove, check for doneness (it should be soft enough to eat) and return the the oven for a few more minutes if necessary. While the squash roasts, prepare the stuffing. 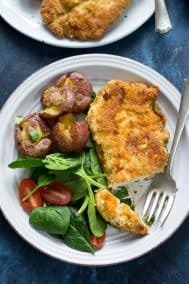 Heat a large skillet over med-hi heat and add a Tbsp coconut oil or ghee to melt. Add your sausage, breaking up lumps with a wooden spoon to evenly brown. Once browned and toasty, remove from heat and transfer to a plate, leaving fat in the skillet. Return skillet to medium heat and add the onions, celery, and mushrooms sprinkle lightly with salt. Stir while cooking to soften, about 3 minutes. Add the garlic and cook another minute, stirring to avoid burning. Add the apples, fresh herbs, and salt and pepper to taste, stir to combine. Cook for another 1-2 minutes to allow apples to soften. Now add the raisins or cranberries and browned sausage back to the skillet, lower heat to med/low and continue to cook another 2 minutes to blend flavors. Once ready to stuff the squash, preheat your broiler and arrange the 4 squash halves face-up on the baking sheet. Scoop the stuffing mixture into each one, filling them evenly. Once filled, set your broiler to hi and broil until tops of stuffing and squash are nicely browned, 5 minutes or so. Garnish with fresh minced parsley, serve and enjoy! 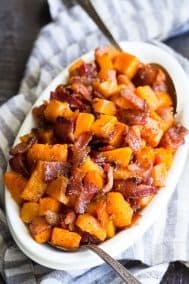 *You can also use butternut or delicata squash if you prefer. **Use 1 tsp each if using dried herbs. 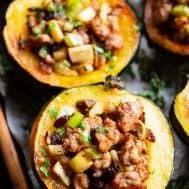 ***You can make the stuffing and roast the squash ahead of time, then simply fill and broil at the last minute for a quick meal. 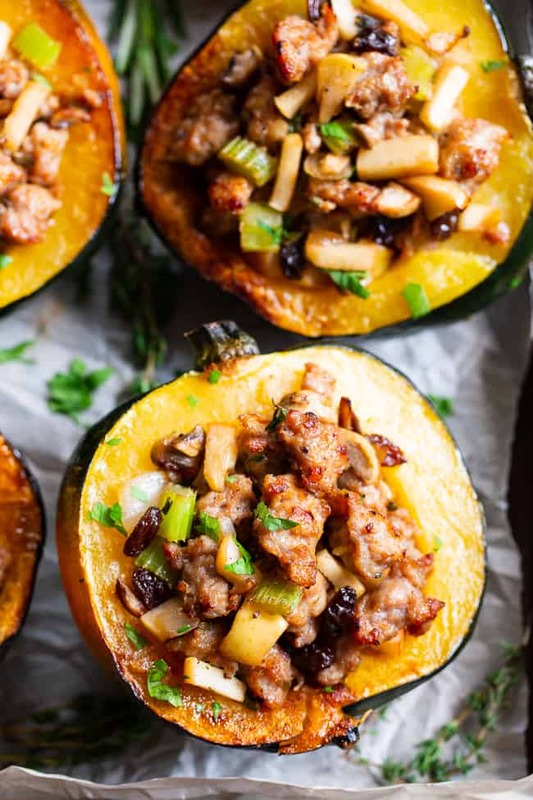 Want More Paleo Winter Squash Recipes? Try One of These! Can you sub beef for pork? The potassium content seems really high – is it really 1192 mg? Or should it be 192 mg? Just wondering…. perfect fall meal! healthy, delicious and a beautiful presentation! This was UNREAL. Like so so so good! 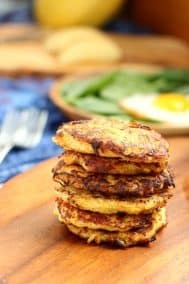 This is by far one my favorite Whole30 recipes and might be just a favorite recipe Whole30 or not! It was so delicious in every way. It tastes like fall, thanksgiving and just pure goodness all in one dish. Thank you! Yummy yummy! I cheated and glazed the acorn squash with brown sugar :p for peeps who don’t like cranberries I didn’t find it a big loss in flavour, the rest of the dish is delish. 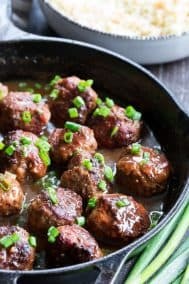 I’ve made a few of your recipes now and am hooked!